What do you think of when you hear the words, “roadside attraction?” Maybe a giant ball of twine or an ax-wielding Paul Bunyan springs to mind. Perhaps a dinosaur straight out of Pebble Rock or possibly even the world’s tallest outhouse clutters your thoughts. But, did you ever consider that these oddball monuments are an important part of our road culture? They represent a time when people spent countless days crossing the country in an overheated car. These attractions provided relief from the endless highways and delighted even the most curmudgeonly of visitors. Unfortunately, after years of neglect and abuse, most of these roadside novelties have fallen into disrepair or vanished from the side of the road. Thankfully, Hampton Hotels is making a courageous effort to preserve our highway heritage, with its Explore the Highway with Hampton, Save-A-Landmark campaign. Since 2000, Hampton employee-volunteers have renovated 22 attractions all over America. This year, they are determined to preserve six of the “World’s Largest Landmarks,” but they need your insight and feedback to help decide which ones to choose. At one point or another, most of us have driven by a larger-than life globe, dresser, or what-have-you, but few of us have actually stopped to appreciate the unusual object. However, if there is just such an attraction that you think deserves to be restored to its original glory, nominate it and help bring America’s past into the future. 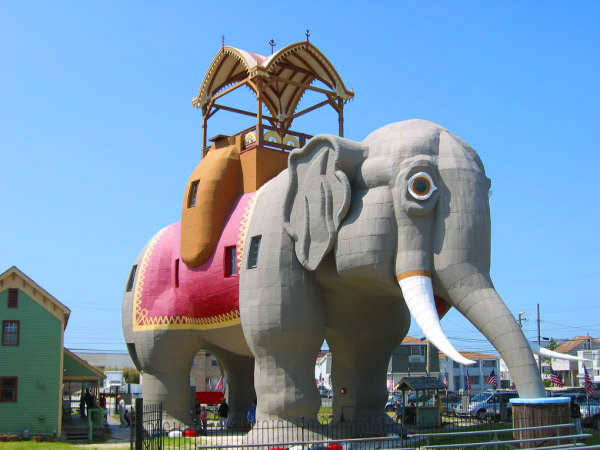 If you need a little help choosing a landmark or you want to appreciate the sheer size of these creations in person, then let Hampton be your guide with its Hidden Landmarks search tool. Trust me, these attractions are worth preserving, as they still provide relief from a long drive, entertain us with their absurd existence, and remind us that life really is more about the journey than the destination.